Angelina Jolie made a bold decision by having a double mastectomy to diminish her chances of being diagnosed with Breast Cancer. Carrying the BRCA1 gene sharply increases the risk for both breast and ovarian cancer. 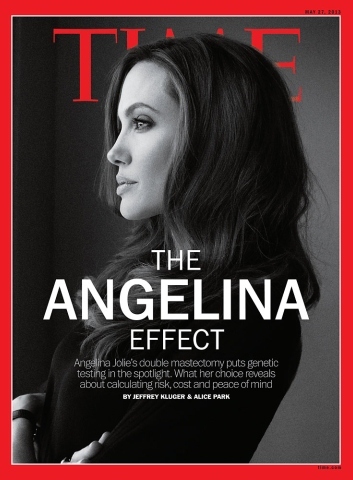 Angelina is opening the eyes of many women who may be carrying this gene and had no idea that these preventative measures are available. Angelina lost her mother to cancer in 2007. Angelina isn’t the only female celebrity living in the shadows of cancer. Sharon Osbourne also had a preventative double mastectomy when she, too, found she carried the BRCA1 gene back in 2007. This was all after being diagnosed with colorectal cancer in 2001. E! TV host Guiliana Rancic went through infertility treatment in 2011 and was told by her doctor to have a mammogram where doctors found early stages of breast cancer. She recalls this as one of the best decisions she’s made in her life. She now has a son, Edward Duke, who is said to be healthy and smart. In 2008, Christina Applegate was diagnosed with breast cancer and decided to remove both breasts even though the cancer was only in one. Her mother also battled breast cancer and after a genetic test, tested positive for the BRCA1 gene. The BRCA1 gene is a mutation that causes cancer. It can be easily detected with a genetic test, but decided on a double mastectomy can be a very hard decision. For those women who have been diagnosed with cancer and have undergone chemotherapy hair loss is a very big issue. I’m sure these actresses wondered how hair loss would affect their lives. At LeMetric we offer a great alternative for women who have lost their hair for any reason. Consultations are free so please call us at (212) 986-5620. Generally hair extensions are separated into two categories; synthetic and human hair, the latter being the more expensive option due to its more natural appearance and quality.